The overwhelming majority of the public, including Republicans, support net neutrality. The FCC just voted to end it. Here's what happens next. Despite last-minute requests to delay the December 14 vote from some Republican members of Congress, it went through as scheduled, thanks to the support of a much longer list of Republicans who favored the repeal and urged the vote to be held without delay. As had been heavily predicted for months, the vote was split 3-2 along party lines, with the FCC chair Ajit Pai and the other Republican members Michael O’Rielly and Brendan Carr voting for repeal and Democratic commissioners Mignon Clyburn and Jessica Rosenworcel voting to protect it. The implications of the repeal are vast and complicated. If it’s left unchallenged, it will almost certainly fundamentally change how people access and use the internet. But it could be a long time before we start to see the full effects of the FCC’s vote — and there’s even a ghost of a chance that the repeal might be overturned by the US Court of Appeals. Here’s what you need to know about what could happen next. 1) What was the FCC actually voting on? The FCC voted on the Restoring Internet Freedom Order, which concerned the repeal of Title II protection for net neutrality. Title II is a decades-old regulatory clause that explicitly classifies internet service providers (ISPs) as telecommunications companies, meaning they’re essentially classified as utilities and subject to the same regulations that other telecommunication companies — also classified as utilities — must abide by. That basic regulatory standard is what people are referring to when they talk about net neutrality. Title II was first applied to ISPs in 2015, after a hard-won fight by internet activists. Placing ISPs under Title II was the only legal way — barring the unlikely introduction and passage of Congressional legislation instituting complicated new regulatory procedures — in which these companies could be regulated. Now that the FCC has repealed Title II classification for ISPs, the ISPs will essentially be unregulated. 2) Why does it matter if ISPs are regulated or not? Classifying ISPs as utility companies under Title II meant they had to treat the internet like every other utility — that is, just like gas, water, or phone service — and that they couldn’t cut off service at will or control how much of it any one person received based on how much that person paid for it. The idea was that the internet should be a public service that everyone has a right to use, not a privilege, and that regulating ISPs like utilities would prevent them from hijacking or monopolize that access. The best argument for the rollback of this Title II protection is that maybe the internet isn’t a public service — maybe it’s just another product, and in a free market system, competition over who gets to sell you that product would ensure accountability and fair treatment among providers, if only due to economic self-interest. But there’s a huge problem with that argument, which is that, as far as the internet is concerned, there really isn’t a free and open market. In the United States, competition among ISPs was driven down years ago thanks to the consolidated nature of internet broadband infrastructure, which has typically been owned by major corporations, shutting out local ISP competitors. 3) What will happen to the internet without net neutrality protections in place? Net neutrality mandated that ISPs display all websites, at the same speed, to all sources of internet traffic. Without net neutrality, all bets are off. That means ISPs will be free to control what you access on the internet, meaning they will be able to block access to specific websites and pieces of software that interact with the internet. ISPs will also be able to control how quickly you’re served webpages, how quickly you can download and upload things, and in what contexts you can access which websites, depending on how much money you pay them. They’ll be able to charge you more to access sites you currently visit for free, cap how much data you’re allowed to use, redirect you from sites you are trying to use to sites they want you to use instead, and block you from being able to access apps, products, and information offered by their competitors or other companies they don’t like. They can even block you from being able to access information on certain topics, news events, or issues they don’t want you to know about. Finally, they’ll be able to exert this power not just over individual consumers, but over companies, as well. This could result in the much-discussed “internet fast lane” — in which an ISP forces a company like Twitter or BitTorrent to pay more for faster access for readers or users like you to its websites and services. Larger, more powerful companies likely won’t be hurt by this change. Smaller companies and websites almost definitely will be. We already have a good idea of how these scenarios might play out, because in the era before net neutrality existed, ISPs tried instituting all of them: via jacked-up fees, forced redirection, content-blocking, software-blocking, website-blocking, competitor-blocking and still more competitor-blocking, app-blocking and still more app-blocking, data-capping, and censorship of controversial subjects. If net neutrality advocates have made it seem like there’s simply no end to the worst-case scenarios that unregulated ISPs might subject us to, it’s because they’ve learned from experience. This history of ISP exploitation is a major reason that advocates for net neutrality fought so hard for it to begin with. And lest you believe that the current FCC is prepared to make sure that such offenses are fully sanctioned and dealt with by the government, think again. FCC chair Pai is a vocal proponent of letting ISPs self-regulate, and seems perfectly content to ignore their contentious and often predatory history. 4) Who will be most affected by the repeal of net neutrality? Women, minorities, rural communities, and internet developers will feel the fullest effects of this repeal. The general argument among net neutrality advocates is that without an open internet, members of society who have historically been marginalized and silenced will be in danger of being further marginalized and silenced, or marginalized and silenced once more — particularly women and minorities. We’ve seen in the past that ISPs can and will censor access to controversial subjects. Without regulation, situations could arise in which underprivileged or disenfranchised individuals and groups have less access to speak up or contact others online. One worst-case scenario that we haven’t yet seen in America, but which is worth considering given the current heated political climate, is that ISPs could potentially play a role in limiting or marginalizing certain communities during times of urgency — for instance, an ISP might choose to block a mobilizing hashtag like #BlackLivesMatter at the start of an organic protest. This might seem like a dire prediction, but there’s precedent for it: In 2011, the Egyptian government heavily censored certain websitesduring the Arab Spring. And in Turkey, under the administration of President Erdogan, the country has become notorious for censoring websites and blocking hashtags, at one point banning Twitter altogether. Rural areas of the US — where internet access is already scarce due to a lack of ISPs operating there — will be further subjected to corporatization and monopolization of their internet infrastructure. More than 10 million Americans already lack broadband access, and as the Hill notes in an overview of the potential impact of net neutrality’s repeal, “Good broadband is a small town’s lifeline out of geographic isolation, its connection to business software and services, and its conduit for exporting homegrown ideas and products.” Without regulatory inducements, corporate ISPs will have little incentive to develop infrastructure in such areas. 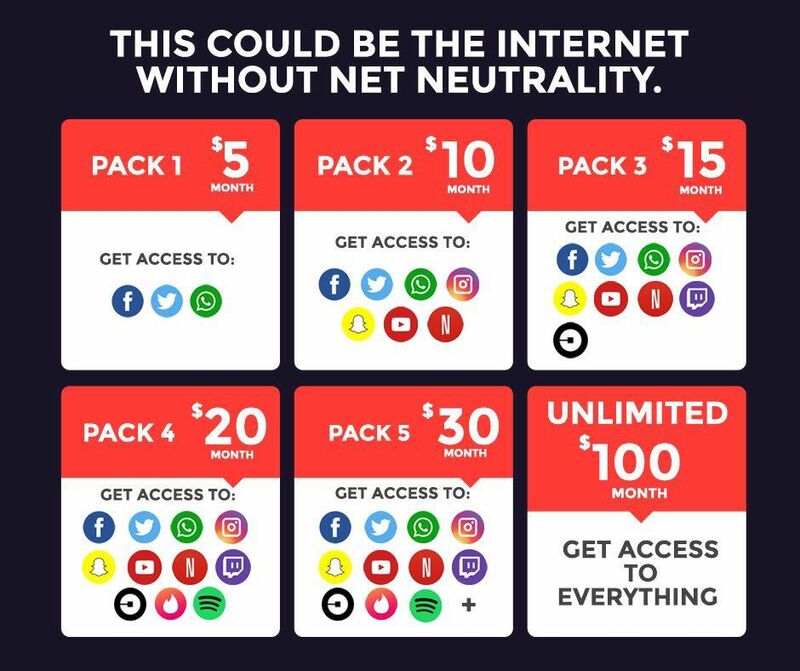 If US net neutrality rules are repealed, future innovators will have to first negotiate with each ISP to get their new product onto an internet package. That means no more permissionless space for innovation. ISPs will have the power to decide which websites you can access and at what speed each will load. In other words, they’ll be able to decide which companies succeed online, which voices are heard — and which are silenced. Again, this all sounds pretty dire — but that’s because it is. The people with the most expertise, the most investment in creating a progressive internet, and the strongest ability to advocate for an open internet could be prevented from doing their best work because of a lack of ability to pay for access to an ISP-controlled space. It’s important to note, too, that because the nature of the repeal is unprecedented, we can’t necessarily predict every group and demographic that could potentially feel its impact. 5) Why did the FCC vote to repeal net neutrality when it had such overwhelming bipartisan support, and when the effects of a repeal seem so dire? Pretty much everybody supports net neutrality — it’s one of the few bipartisan issues that most of Congress and most American citizens agree on. The glaring exceptions are the giant ISPs who are reigned in by the regulation. So Pai has basically always supported the repeal of net neutrality, despite the overwhelming public support for it. He believes the 2015 ruling was frivolous and unnecessary, and has also argued, in opposition to hard evidence, that investment in the internet shrinks when net neutrality is in effect. With Trump’s full backing, he has made undoing it a priority. 6) What happens now, in the immediate aftermath of the vote? A flurry of lawsuits from tech companies, internet activists, and think tanks will likely descend upon Washington — starting with a protective filing by internet activists that will appeal the FCC’s vote to prevent the repeal from immediately taking effect. Mere hours after the FCC vote, the Attorney General of the state of New York announced a multi-state appeal of the ruling, to which a number of other states quickly signed on. The exact number of states participating in the appeal will grow over the coming weeks — technically after a suit is announced, the states (as well as any latecomers to any other lawsuits filed) will have 60 days to join in before the suit closes. These lawsuits will petition the US Court of Appeals for a review of the FCC’s order. After a filing period of 10 days, all of the lawsuits will eventually be punted collectively to one of the Court of Appeals’ 12 circuit courts, and the ultimate outcome will be largely dependent on which court hears the appeals. 7) When will the repeal go into effect? We simply can’t know at this point. Establishing a workable timeline will depend on a whole heap of factors, such as which circuit court ends up hearing the appeals, whether there is a motion to relocate the appeals to another court, any motions or counter-motions filed on the appeals, and so forth. There’s also the likelihood that net neutrality advocates will ask for stays of the FCC’s ruling so that it can’t take effect while motions are still being heard and appeals are being deliberated. Additionally, there’s one alternative to the appeals process that’s definitely a longshot, yet still a possibility: Congress could move to pass a joint resolution overturning the repeal and establishing new regulatory oversight. However, given how firmly many Republican politicians have stood behind Pai’s repeal campaign, this seems highly unlikely to happen unless the 2018 midterm elections result in a major upheaval of Congress, and could take years to hash out. In a nutshell, we don’t know how long will it take to fight the repeal in the court system, so we can’t know when — or if — it will take effect. It’s likely that even if a court overturns the FCC’s decision, that court may only overturn part of it and not the entire thing. What the final version of a net neutrality repeal might look like, and when it might take effect, are both unknown at this point, with the future of an open internet hanging in the balance. Aja Romano writes about internet culture. follow her on Twitter @ajaromano.